Has a small flee bite ding as shown in picture, light , very light scratches, that can not really seen in pics because are light. 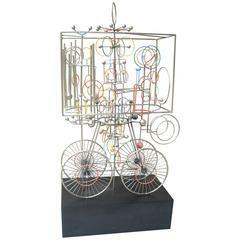 Great sculpture, dated and signed, by Joseph Burlini, 1972. Sculpture high by itself, 27 inches. 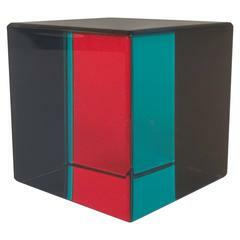 Ball sculpture by Vasa Velizar Mihich Incised signature and dated 1997 Acrylic. An unusual variation with subtle color phasing. Signed and dated #1877 Vasa 1981. 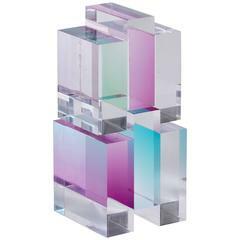 Stacking two-piece clear, magenta and turquoise acrylic cubist sculpture give an optical illusion when viewed from different perspectives. Unsigned, attributed to Vasa Mihich.